The Mission to Thessaloniki – Acts 17:1-9. Timothy left behind whilst Paul at Athens. Silas at Berea. 1 Thess 3:1-2, 6. Paul alone in Athens. Issue: New means that do create movements, but do not have the blessing of the covenant of grace. Paul and Silas and Timothy to the church of Thessalonika, by God the Father the by the Lord Jesus Christ. Grace to you and peace. Review Q: How are these men called “apostles” in 2:6? 2:6, the term apostle used for the cohort of the three men. A: They are not all Apostles of the Lord Jesus, as Paul is a witness of the resurrection, but they are apostles in the sense that they were sent by the church in Antioch on mission. >>>The Latin word missio is the root word translation of the the Greek word group for apostellomai. >>>This is from where we get our term missionary. We offer thanks to God always for all off you, remembering (parallel ptc) you while making mention in our prayers, constantly. Remembering your faithful work [attibutive] and loving labor (attributive) and persevering hope [attibutive] of our Lord Jesus Christ [applies to all previous phrases] before our God and Father [they did all with an eye to serving God- the true ethic is to do what is right with the goal of a mind in service to God throug Christ]. Q: To whom do the missionaries credit the work, labor and hope? Q: How would prayer support this view that they relied upon God? A: Missions is the activity of God and we pray for God to act. >>>Prayer is the act based on the reality of God’s providence. Q: What if our missionary activities did not rely upon God? What would they look like? If Jesus gave us the mission, but no guarantee of providential success, how would our methods look differently? Would we pray? Point: Mission activity should all be done in ways consistent with the sovereignty of God to bless with the benefits of the covenant of grace. Issue: Human methods may work and in general providence we may see the effect of movements done without the blessing of the covenant of grace become very large and influential. But if they do not attend to the means of the keys of the kingdom of the covenant of grace, they will not be the means of that grace, not will they be the means of applying the covenant of works. Q: How did Paul know they were elect? verse 3, the hope, work, and labor. And in the repentance and faith in verse 9-10. ***This teaches us that the effects of salvation are helps to our assurance, and others who minister to us. They are not the thing to be trusted, but they help us in the assurance that we are truly Christ’s. Q: How does election factor into Paul’s missions methods? A: The same as prayer, it relies in total dependence upon God and the means he appointed for the dispensing of the grace of the covenant of Grace through the foolishness of preaching, prayer, sacrament, fellowship, and speaking the truth in love, family worship, etc. Segue: This leads us to the next section = about the model of missionaries and mimicking by the Thessalonians. For our Gospel did not come about unto you in a word only [he shows that they lived as examples of those who carry the message, it was not a bare message without living men who spoke it, Rom 10:11-14], but also [intensification] by power and by the Holy Spirit, and by much full-confidence [attributive: much – polle- intensifies the way the Gospel came with full-confidence- confidence that the Gospel is the truth, way of salvation, and will call men to the Lord], as you know such kind of men we became among you for your sake [the apostolic company came among the Thesalonicans as living examples of the kind of life the Gospel message produces, namely power, the Holy Spirit, and full-confidence. This was for their sake in the sense that it was an example to them, which he below will express that they emulate]. Q: Why would they seek to clarify that the method of the Apostles was not word only? What is so important about that? A: Because the Word is the means of grace, but also the manner by which it is proclaimed is also important. Ex: John Owen would say, those sermons which most powerfully came through me have been those which most powerfullly come to me. Ex: OT word for prophetic burden, masa‘. which means that the burden of the word must be allieviated by proclamation. Q: are these three things (Spirit, Power, Much full conviction) upon the preachers or the people? 2:13, talks about the effect in the people. ***This is often used today to bottle revival in the form of waiting for this special kind of preaching event to happen. That presumes it is on the people. Actually, this is about the way one is supposed to preach. ***cf. 1 Corinthians 1:17ff. The Apostle showed that preaching should not work if not done in a socially accepting way – i.e., persuasive words of wisdom/rather than the clear word of the report of the Gospel, not itching ears (which would be the equivalent of preaching health and wealth benefits today because modernists want religion to be pragmatically helpful to society and life). God gives preaching, and this manner kind of preaching, his blessing. Misunderstanding: Often expositors who are seeking revival will seek to either bottle a formula for revival, or say, that it is in God’s hands, and we just preach the word. Answer: Both have the same misunderstanding of this verse. They think it is about the people who receive the word in power, and the Holy Spirit, and full conviction. That is not what Paul says. He says the Gospel (content) came i.e, through Paul Silas and Timothy who were fully convicted of it, powerfully changed by it, and in communion with the Holy Spirit who spoke it to them. They were, to use Paul’s words from 1 Corinthians 2, demonstrating the Holy Spirit and power in them to the people who heard. >>>It is about the manner of preaching by the minister, not just the effect. 2:13 would be an appropriate example of the reception of the people. And you became imitators [2p] of us and of the Lord [the imitation is following the model of suffering in union and imitation of Christ, 2:2], having received the message in much tribulation with the grace of the Holy Spirit [the Holy Spirit carried them through the initial reception providentially, through his good providence]. Q: What did they mimick? …so that you were to become [middle voice infinitive] a pattern for all who believe in Macedonia and Aichaia. The kind of reception of the Gospel is typical, tupos, of the way Christian churches are to be planted. For from you sounded forth the message of the Lord not only in Macedonia and Aichaia, but in all places your faith which is toward God [that is it was found to the the very message of God learned from Zion- Isa 2:3 And many peoples will come and say, “Come, let us go up to the mountain of the LORD, To the house of the God of Jacob; That He may teach us concerning His ways And that we may walk in His paths.” For the law will go forth from Zion And the word of the LORD from Jerusalem. ], has gone forth; so that we have no need to speak a thing. >>>Not just doctrinal faith, that would be the faith, nor just subjective faith, because the message in verses 9-10 is the objective Gospel. So what is the meaning here? Answer: it refers to the doctrinal faith in which they believe, so it can be rightly called their faith. They trust in that which was proclaimed to them, and they proclaim what they believe. Q: How does their faith function in the ministry of the church? 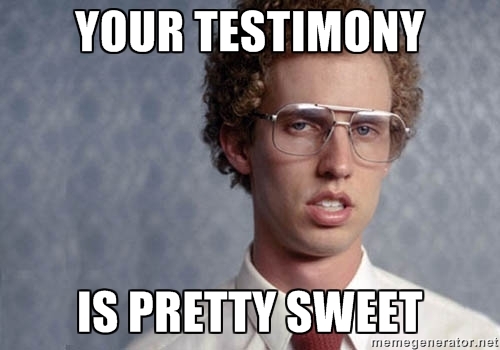 Does it mean testimony time? Yes in the sense that we believe the Gospel, thus we proclaim the gospel as our faith, and the resulting change of life it has brought about in us is part of the way we proclaim it. >>We use the word “approach” in English not only for the verb for drawing near something, but to the methods one would go by to accomplish something. I take this to mean their approach to ministry. Act 14:15 and saying, “Men, why are you doing these things? We are also men of the same nature as you, and preach the gospel to you that you should turn from these vain things to a living God, WHO MADE THE HEAVEN AND THE EARTH AND THE SEA AND ALL THAT IS IN THEM. 2-4, Prayer – thanks to God who chose and proved it by their faith love and hope in labor work and perseverance. 9-10, Message – not only the turning from the idols but the whole Gospel even to the hope fo the coming resurrection of all at Christ’s coming. Issue: Other church who do not know what tone to set… how to start… method? Point: So we must be confident, Holy Spirit communing, and Powerful (v.5) as we speak our faith (8). This apostolic “manner” sets a tone for the whole mission. The first thing people learn about the missionaries is that they are confident in the Holy Spirit’s power and the election of God for discipleship and making disciples. The initial pattern set will set a tone for the latter missions, and the latter mission for the further missions. It is important to begin with confidence in the word and Spirit. The two are linked, message and Spiritual power. There is nothing more valuable than the minister and his cohort coming into a new town with full confidence in the doctrine, method, and power of discipleship.